I've almost missed that update! What a great... advert or movie or just a graffiti? 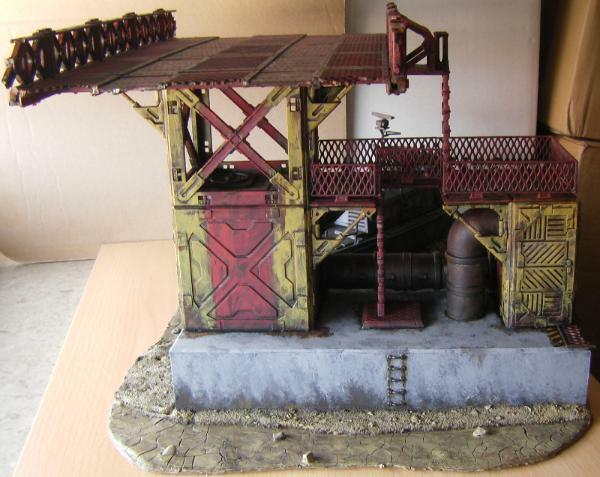 Anyway, it is a very nice terrain piece and in line with other Your gems. Thumbs up! It's a movie ad based on a trailer shown in theaters in Fallout 4's DLCs, using a still with the monster's hand reaching for the girl as a basis and the font show on other stills for the text. The bridge isn't making any progress whatsoever because I'm too busy dying of the heat to paint anything that large. Until it cools down, terrain painting is on hold. 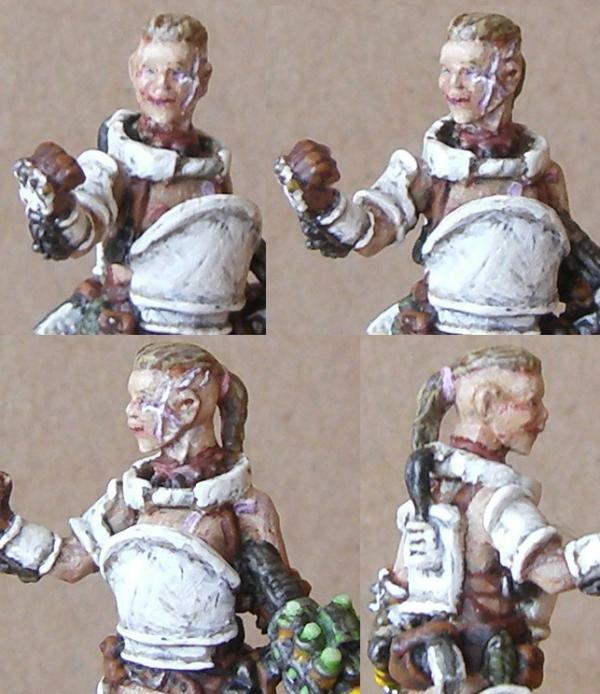 So, I'm giving Piper's sculpt a good look over and if I don't find anything that needs fixing, I'll decorate the base (not quite sure on the design yet) and get to painting. Mostly I used the extra time to assemble some Stormtroopers for Star Wars Legion. Not the worst way to spend my time as I love Stormtroopers and they look neat, but I had hoped to be working on some Wasteland Warfare models by now. Unless the lure of Deathclaws and Sentry Bots is too strong, I think I'll get the Minutemen playable first to prepare for when my friends get their Super Mutants and Brotherhood. I already have conversions in mind to get some extra Minutemen in combat armor and even one in power armor, but don't worry. At least the ones in combat armor will have their stupid laser muskets like the idiots they are. Great little details and a good looking face there! I envy all these sharp and imaginative work. And - yes, Modipius really should speed things up, there are too many projects stalled in the line. Lovely details with the camera and the 'press' badge. I'm really impressed with her face! 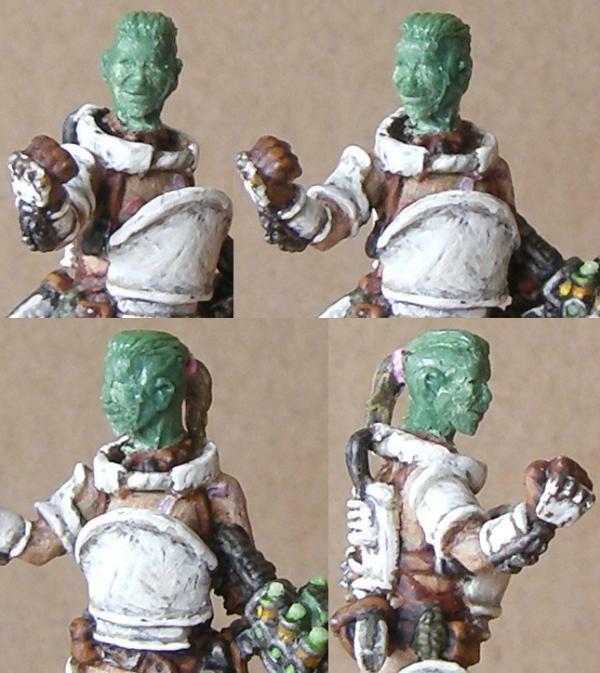 Excellent work on Piper,that's a great sculpt. I forgot to add a hint of the camera sling under the one holding the bag along with a hole on the inside of her forearm I didn't catch (that one was really hard to see, and reach). Both are fixed now and I'm hoping I'll get the base done this week and start painting. Happy news on the bridge front, too. One cooler day in this heatwave saw me put a fair bit of paint on it. Yay! I think it's forecast to cool down again so I should be able to get some more regular work done. After resculpting Andrea's face to bring her up to the same standard as Dao and now Piper, I found it increasingly hard to tolerate Vera's face. Although better than Andrea's original one, it was still not up to my current standard. Which I set out to rectify over the last couple of days. Technically I'm painting Piper, but things didn't go smoothly and I couldn't get as much work done in the last week as I wanted. 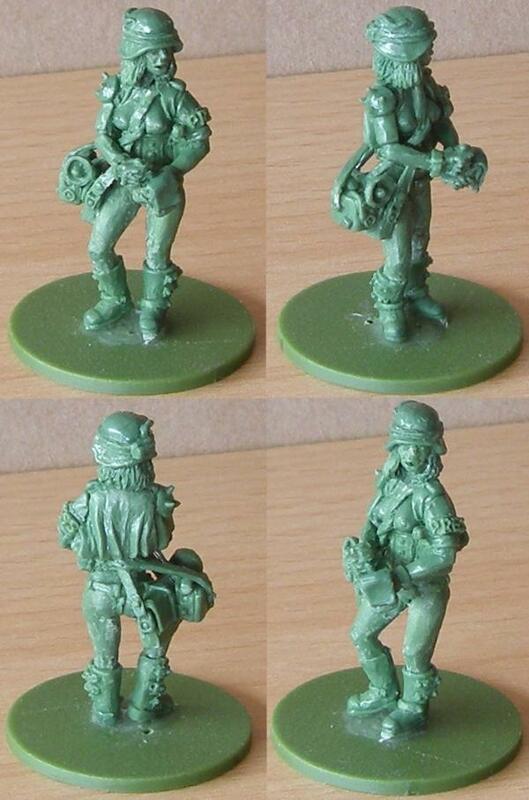 However, i don't expect that to last and have her painted by next week at the latest. 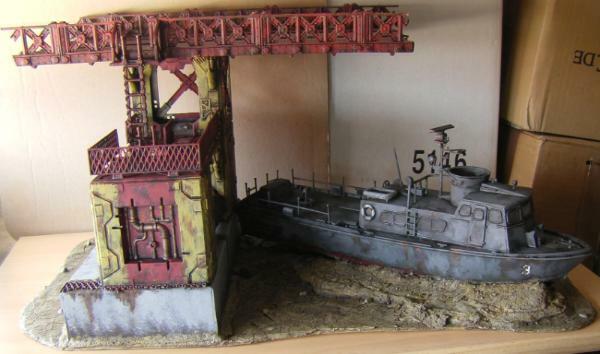 More good news is that I did considerable work on the bridge. In a frightening and unprecedented burst of activity, I wrapped up most of the painting on the piece last week. I will have to, um, fill up some potholes on the base that didn't get enough sand initially, but afterwards I'll will only need to paint the base and finish a few fiddly bits and the model is done. Only took me a year, too. Hehe. Neat stuff! Nice job with the freehands. A bit impressionistic... but considering the scale - great! Just great! Somehow I've imagined her in a more desert-like camo, but jungle dirt is good too. And these mushrooms... Good batch. Wasteland, Rail Nomad? Thank you. I like to stick with good old olive drab because it's so US Army. Such a classic. I do prefer browns to greens, though, so that's pretty uncharacteristic of me. I had to look up Rail Nomad because I didn't know what that means. Still don't, really. I haven't played Wasteland (yet). 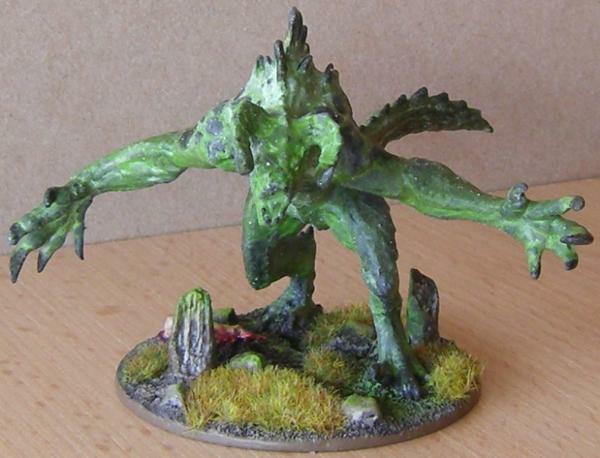 I used some mushrooms of that design before, using up the few I had from an Age of Sigmar basing set. I kept these new ones in the same style, sculpting green stuff over a short metal rod. 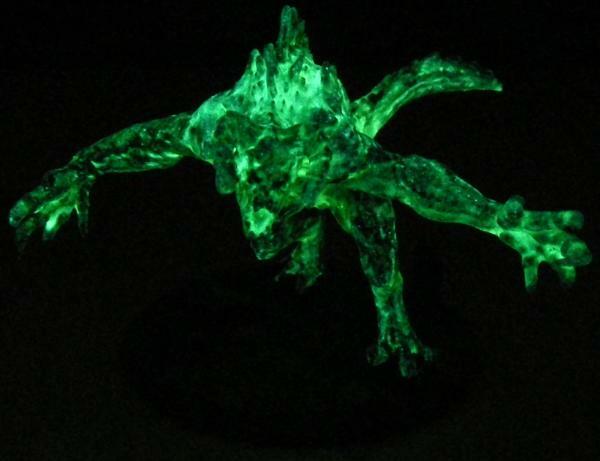 but of course they have to glow. Mushrooms in Fallout 4 glow. 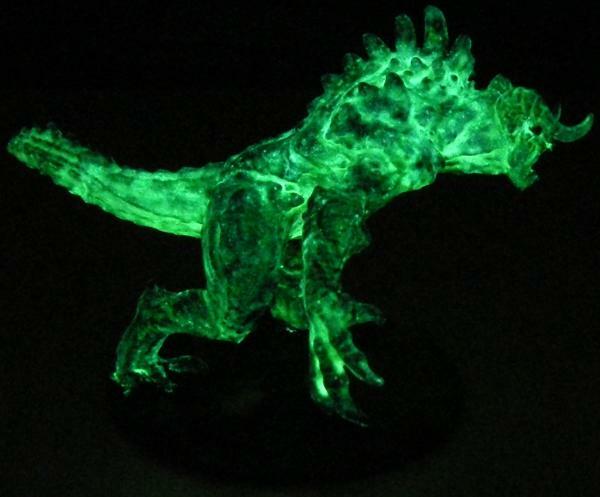 So I want mine to glow, too! Behold the end of eternity! OK, that may be a little melodramatic, but the ship and bridge certainly felt like they took forever. This piece took so long that I put (almost) any thought of what to do afterwards aside. 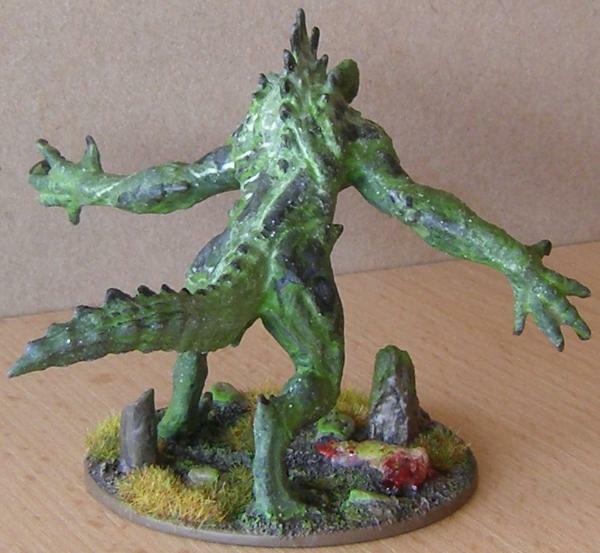 I have several possible terrain projects I can work on, but for now I'm completely undecided. 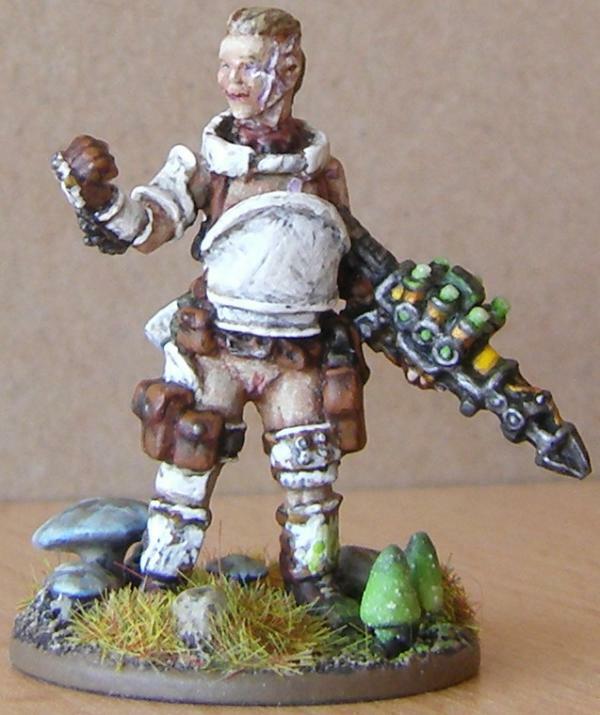 As far as models go, I expect that I'll get my first Wasteland Warfare models before the end of the week, so I might do something with them provided I have the time. 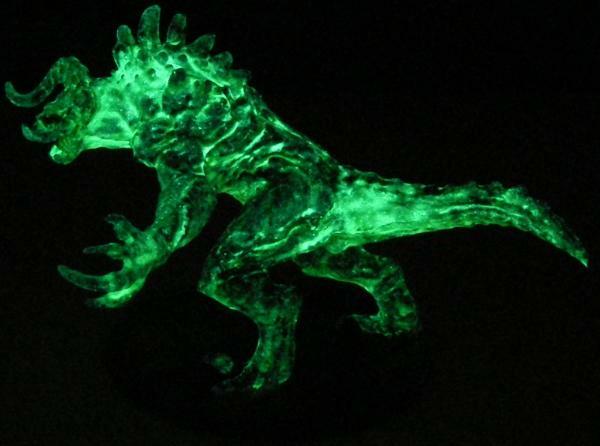 Obviously Glowy glows in the dark, as tested on several things before. Thanks to getting a solid idea of how my glow in the dark paint works while working on Bubbles, I gave Glowy more contrast both by day and night. 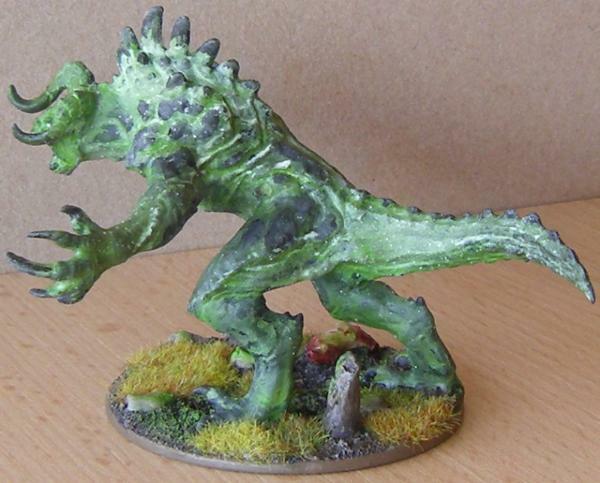 It also helps that Modiphius's Deathclaw is larger with more surface structure than Brother Vinni's. I don't know if I'll work much on scenery in the coming weeks, now that I have something a lot more shiny to paint (and convert, eventually). 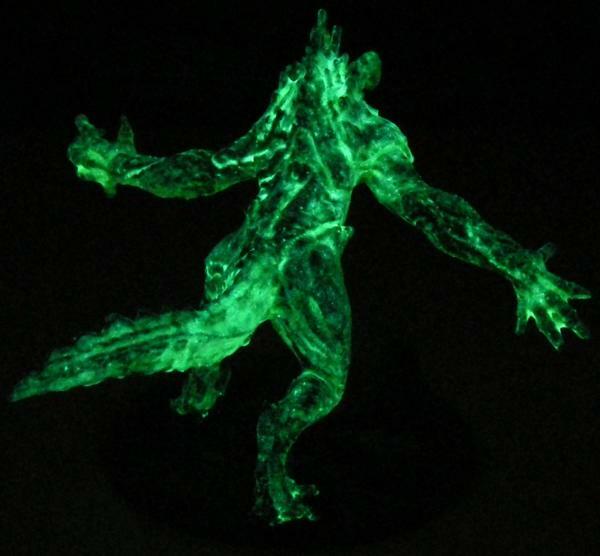 Glowy looks incredible, any chances of some pics of him in the dark? What works for me is piling up my boxes and dreaming of the things I could build with them if I didn't have so many things to do already! That is something to give creeps for a week at least! Nicely done! And that bridge is very well done - is it actually done now? Cheers! Top marks for glowy.... The nocturnal pictures are great. 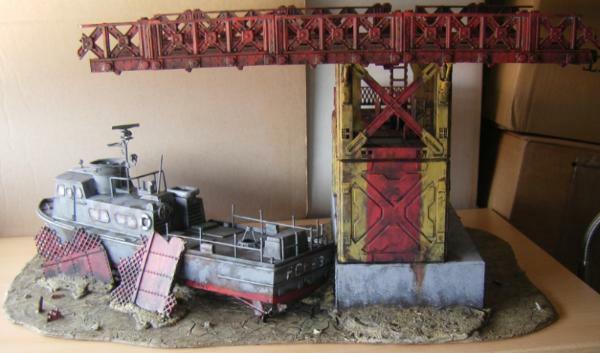 Yes, the bridge as a terrain piece is done. I will likely never play it like that though as the top of the bridge is pretty barren. I'll probably always have some wrecked vehicles on there once I get some painted. I intended to leave it modular to allow for different scenarios to make use of it. Vertibird extraction, for instance. Maybe a shack for an eremite or something. Lots of potential. I even have some loose traffic cones to put on the edges so if you fall off, it's your own fault. I regret asking, that thing is even more terrifying in the dark! I'll have a small band of these by the time I'm done. The plan is to have this be a freshly crashed one (as I want one of every model stock, so no conversions on this one), two more that have gone native because they crashed a longer while ago, and an alien hybrid (which will probably be based on Feral Ghoul rules, since that's the closest they were to in Fallout 3). 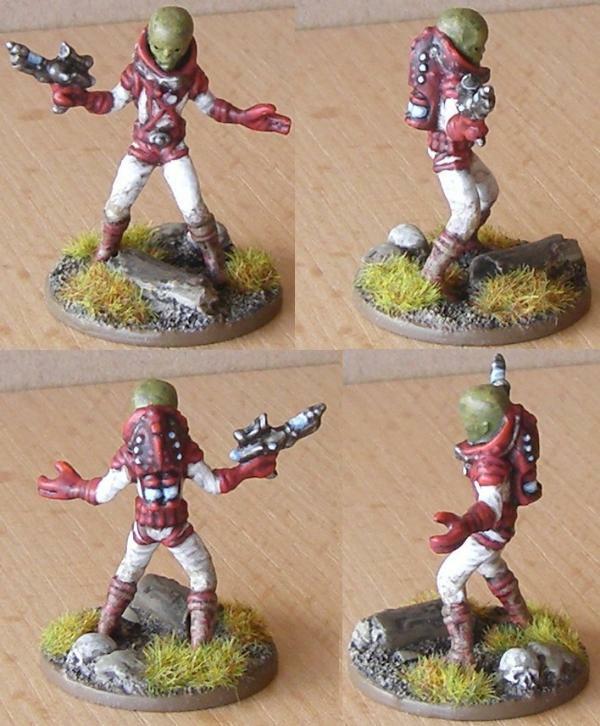 I have primed Minutemen on my desk as well as a need for a Star Wars Legion army, though, so it may be a while before I get around to that idea. I put in gallery votes for the Glowy in the dark images, that is something that should be on the Dakka homepage for all to see for sure. Great concept and great execution! All Orks, All Da Zoggin' TIme. 'Cause Da Rest of You Gitz is Just Muckin' About, Waitin' ta Get Krumped. 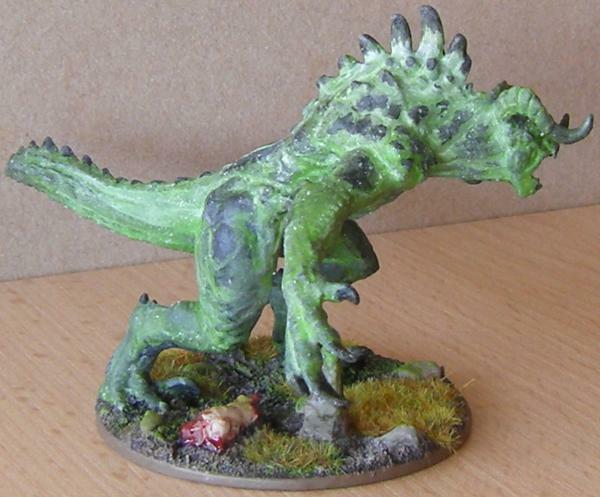 Wow, great looking Fallout minis all around! 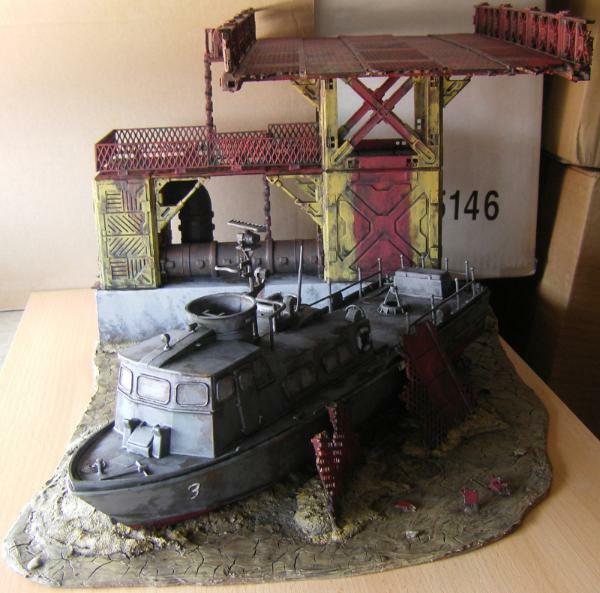 I especially love your scenery pieces, and those freehand adverts! I saw your glowing deathclaw in the gallery. Super awesome work on everything here.